Built strong to last long, these attachments will collect, dump, and sweep up any dirt and debris you may have lying around before or after your job. If you need to break up any hardened mud or other rough material, use the reversible cutting edge built right into the sweeper. From roadways and driveways to docks and warehouses, these sweepers are ready to take care of any mess you can throw their way. These are by far the most versatile sweeping attachments on the market today. 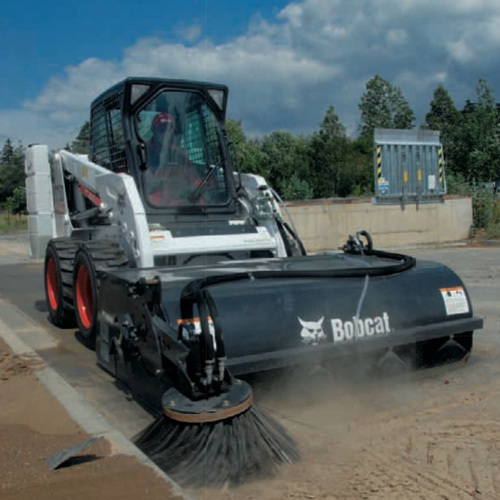 Bobcat’s genuine sweeping attachments are built with the strongest, most durable poly bristles on the market. They’re attached with a sweeper bucket that hold the dirt and debris you’ve scooped up until you’re ready to easily dispose of the load anywhere convenient for you, and it all runs on a heavy-duty, smooth running hydraulic motor. The innovative design of the Bobcat sweeping attachment means that you never have to deal with installing and removing multiple attachments that should all work together to complete the job they way only Bobcat’s products can. With Bobcat, you can rest assured that you’re always getting the most innovative, high quality products on the market, and they’re all backed by a one-year warranty. Bobcat’s customer service is guaranteed, and their superb servicing staff is always there should you need help with anything, from assembly to repair. This handy attachment sweeps, collects and dumps dirt and debris. In addition, it cleans up in forward or reverse. Perfect for cleaning parking lots, sidewalks, docks and warehouses. An optional gutter brush is available.